Social networks are Petri dishes in which we can watch memes emerge and spread by imitation. Three years ago, I traced the effect of a powerful one created by the ACLU: a fictional screencast about a dystopian future in which identity and privacy have gone horribly wrong. What I found when I looked at the data was that, although forward thinkers and actors in the realm of digital identity had only recently become aware of the ACLU’s powerful meme, it had been active for 18 months, most forcefully at the beginning of that span. In that case the meme was an idea which, because it was neatly represented by an URL, could be tracked by using services like del.icio.us and bloglines as proxies for the attention that flows to an URL. In other cases, a meme is best represented by a word — often, a neologism. There’s no canonical URL to track, but there are other ways to monitor the spread of the meme. Search engines, for example. In the case of screencast, for example, there were 200 Google hits for screencast in April 2005, 60,000 in June 2005, 325,000 in November 2005, and there are 3,000,000 today. I’m always on the lookout for new ways to make these kinds of observations. Yesterday I encountered Pecha Kucha for the first time. It has a Wikipedia page, so the revision log there is one source of insight. Since I encountered the phrase on Twitter, I tried a different strategy. While relaying a definition of the term, I used the tag #pechakucha. I realized that these Twitter “hashtags” are another proxy for linguistic memeflow, so I plotted occurrences of the tag on a Timeline. 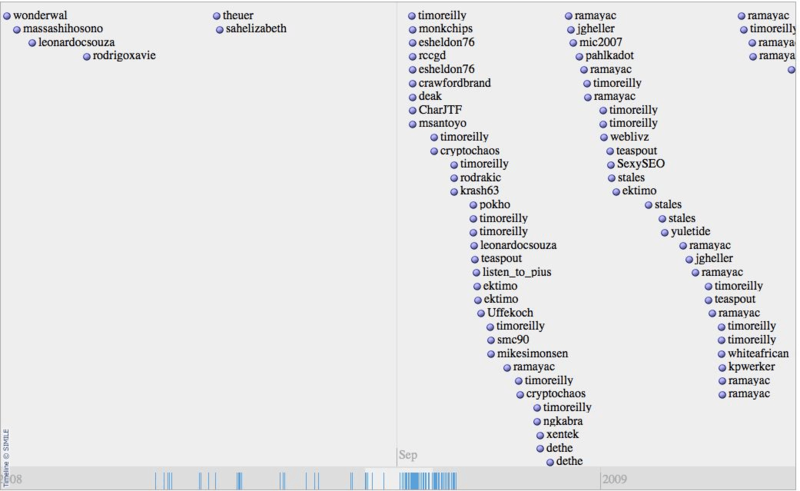 There were only 16 occurrences as of yesterday, so it’s a little sparse, but the same approach can be used to provide insight into the birth and evolution of any Twitter hashtag. Here’s a Timeline for #quotes. It started on April 6, 2008, when Leonardo Souza quoth: “#quotes ‘This story, like any story worth telling, is about a girl'”, which evidently is from Spider-Man. This method will be most useful for watching Twitter hashtags that haven’t yet been widely adopted. If you apply it to, say, #ike you’ll run into two problems. First, Twitter’s API caps the number of search results you can retrieve, so in the case of #ike we can only see back as far as September 18. Second, Timeline struggles to display thousands of events. These are general problems. No matter which Petri dish we observe — del.icio.us tagspace, the blogosphere, Twitter — our ability to watch memes evolve is limited by the amount of data we can gather, and also by our ability to effectively visualize what data we can gather. I expect both constraints to gradually erode. As they do, this game of meme tracking will become even more interesting. I’ve been fascinated (or horrified, pick yours) at the ability of coordinated efforts to propogate memes. The one to watch on twitter right now is the immense number of single purpose political twitter accounts set up to post something about ACORN (and nothing else) at all hours of the day or night. They don’t follow each other, for the most part, and don’t appear to have any human attached to them directly. I’d be very cautious of attributing all trending items to the term “meme” – you might be faced with whatever the astroturf equivalent of that term is. Agreed. With small numbers of contributors, though, as in the examples I showed, it’s easy enough to click through and see at a glance what is human and what is robotic. I’ve used search results as one metric of how an idea is spreading; I’ve used the number of delicious tags as well. These are not perfect measures, but they can be illuminating.